No excuses: when visiting Scandinavia trying fish is a must, and Stockholm is no exception. Fish is a fundamental part of the Swedish cuisine and many are restaurant and bars serving traditional fish meals. Kajsas Fisk is one of them but with an authentic, local taste. The restaurant is inside the Hötorgshallen market, one of the biggest covered markets in town where you can find typical and international food. Kajsas Fisk hasn’t changed in decades, apparently, beside one recent re-modernization of the whole market. The style is really simple and unpretentious, but the food is great and reasonably priced. Once off the escalators, skip the cheese counter (you can get back there later if you wish) and go straight to the fish stalls, looking for the Kajsas Fisk sign and the huge hanging salmon (it’s not real, don’t worry!). The place is often crowded, so be ready to queue up to be served and find a seat but, I promise, your efforts will be well repaid. 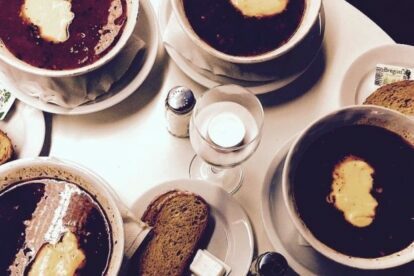 Although the menu offers typical fish-based meals like fish and chips, the absolutely bestseller here is fish soup. Delicious. And (not many know, including locals) the first refill is free. They also provide take-away portions, in summer it might be nice to have lunch sitting on the Konserthuset stairs (best sunny spot in the square). How about that, fish soup tomorrow?